For the past few summers, The Child and I have been tormented by unwanted guests. Not the rats that occasionally move into the crawl space, silent and unseen. Not the moles, which are visually destructive, but silent, and at least provide some marginal comic relief, in the form of neighbors doing Bill Murray In Caddyshack impressions. The bees, on the other hand, we can hear, and they’re loud: They buzz aggressively on the other side of my office wall, and The Child’s bedroom wall. Last summer, I hired a bee guy, who couldn’t locate them easily, but based on an inspection of the outside of the house, informed me that my noisy neighbors were “probably” mud daubers. They are tiny and harmless wasps, he said. Probably coming in through the vent screens. I suggest you wait until winter, when they go dormant, and replace the screens. He took my check and was on his way. With winter almost over – at least in Seattle – my thoughts turned to Spring, and I called my handyman, who stopped by and inspected the crawl space next to my office, and the one next to The Child’s room, and then the attic area; he found nothing. He moved his ladder outside, and climbed onto the garage roof, and inspected the wall. Eventually he climbed down, and said he’d found two warped siding boards: The gaps are how the bees were getting in, he said. Your screens are fine. Then he handed me his phone, to show me the pictures he’d taken of the furnace vent, specifically, the holes that had rusted out of it. He went into the attic again, and came back with more pictures: more rusty holes. I stare at the pictures like the inadequately knowledgeable homeowner I am. Those holes will vent carbon monoxide into your attic, he tells me. I listened to the sound of the mud dauber wasps in my wall all summer, several years in a row, and they frightened me, but could never have hurt me. It would seem I owe them a debt of gratitude, since they led to the discovery of a very real danger that I could have neither seen nor heard. I am grateful to the wasps, as I stand on a ladder, trying to help the handyman loosen rusted pieces of vent pipe. I am grateful to the wasps as I make a note on the grocery list to replace the batteries in the smoke detectors, including the one that kept going off, with no obvious cause, a year or so ago. I am grateful to the wasps as the handyman nails down the siding, closing off their entrance to my wall. When the handyman leaves, I lock the back gate after him, and notice that my rhubarb is coming in, and not just a little. I’m absurdly happy: The sun is shining, The Child and I aren’t going to die in our sleep, and there will be rhubarb, soon. Spring is coming; it’s almost here. There isn’t much in the way of in-season produce that I actually want to eat at the stores, but late last summer I received a small bag of Oregon hazelnuts as a gift, and thought that now would be a good time to use them. I wanted cookies and cakes but since I also had yet another mushy banana to use up – just one this time – I chose a recipe from the Macrina Bakery & Cafe Cookbook that included hazelnuts, a ripe banana, and other things I already had on hand: carrots, molasses. The ingredient list sounded like a healthy way to start a day, and the name – Rocket Muffins – suggested they’d kick-start me with energy. 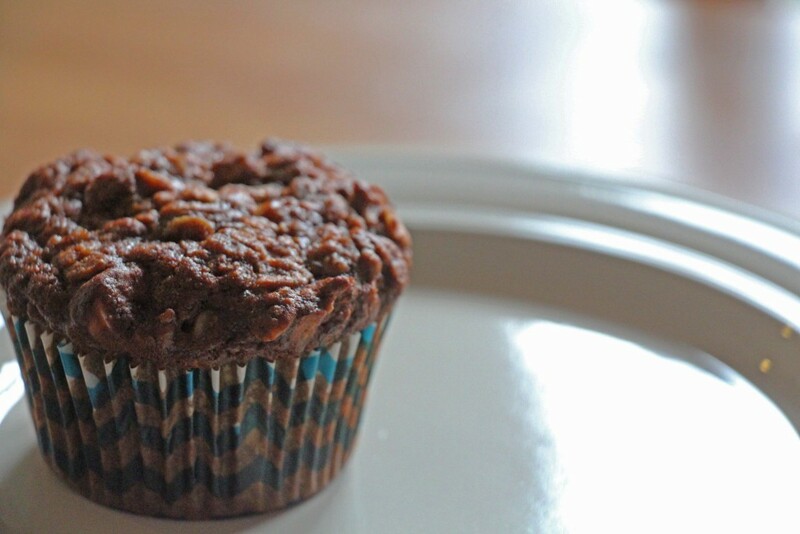 One thing I didn’t have on hand was whole wheat flour, and since I was feeling kind of lazy, and thus in need of a muffin to kick-start my energy level, I swapped in some dark rye flour to see what would happen. The original recipe also calls for adding a dollop of jam to the top of each muffin during baking, which I skipped entirely, figuring I’d rather add whatever flavor jam I felt like eating at the time I ate each muffin. I don’t know how these are supposed to taste, and to be honest, when they first came out of the oven, they reminded me of the supposedly healthy “bread” that was the bane of my 1970s school lunches. A liberal dose of melting salted butter did not help matters much. I set the muffins aside, but vowed I would finish them – all of them – no matter how much jam it took. The next morning, I was running late, so I grabbed one of the muffins, and ate it at my desk as I began work: No jam, no butter. It’s hard to appreciate a muffin that isn’t sweet, when muffins, for the most part these days, are simply small cakes pretending to be muffins. But when you stop expecting something to be sweet, and when there is no sweetness to overwhelm the flavors, well, you can really taste them. The delicious crunchy, nutty hazelnut was shown off superbly by the earthy rye and molasses; the buttermilk probably accounts for the muffins’ ethereal lightness. They don’t need jam or butter or to be toasted or anything, except to be eaten. And the best part: The Child doesn’t like them, so I get them all to myself. Preheat oven to 350F. Spread hazelnuts out on a baking sheet and roast until they're golden brown and fragrant (about 15 minutes). Cool slightly and remove the skins by rubbing nuts together in a clean dish towel. Chop coarsely and set aside. Whisk the flours, brown sugar, baking powder and soda, and salt together in a large bowl. Add the oats, nuts, and carrots; toss together with a spoon or your hands until the carrots are well coated with flour. In a medium bowl, beat the eggs. Whisk in the banana, oil, molasses, and buttermilk until thoroughly combined. Add the liquid mixture to the dry mixture, stirring with a fork until the batter just starts to come together. Spoon the batter into a paper liners in a muffin tin, filling the cups to the top. Bake until the muffins are deep brown and spring back when pressed lightly with a finger, 15-20 minutes. Cool on racks. The one downside to removing the wall unit is that the amount of shelf space available to house my cookbooks was reduced dramatically, but this turns out to be less of a hindrance and more of a blessing. Sorting through the cookbooks, I find myself wondering why I still own one that I have never used, from a restaurant I ate soup in once, 17 years ago, only because it happened to be across the street from my office. Since the only thing I really remember about the soup is that I thought it was overpriced, even by New York City standards, I am wondering why I bought the book in the first place. It turns out I have a lot of cookbooks like this, which I put into piles in another room, and, eventually, discarded. Even though it will be some time before I figure out the remaining details of hanging pictures and placing knick-knacks, the family room is now a cozy place, pleasant to sit in on a weekend morning, drinking coffee and waiting for baked goods to emerge from the oven. I made this bread right around that time, trying to find a way to make zucchini bread that was a cut above the usual. 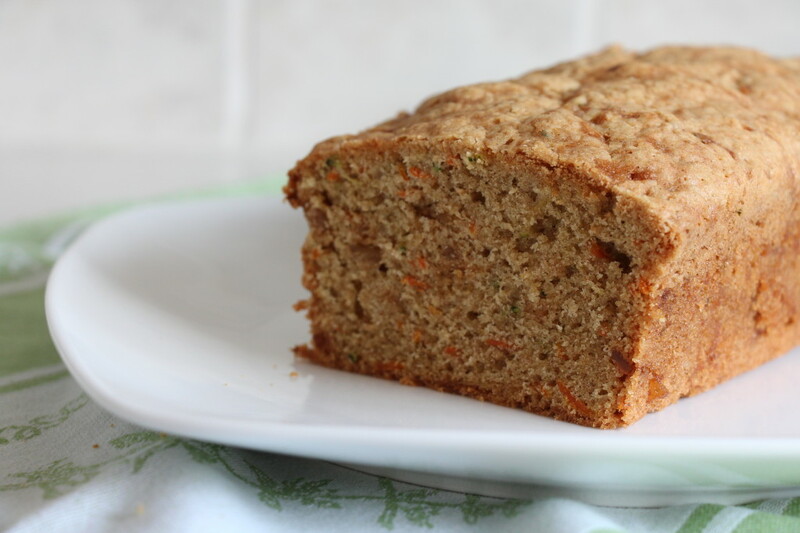 I found the recipe on the Sur La Table website, but it can also be found in one of their cookbooks, Eating Local ; it is probably the best zucchini bread I’ve ever tasted, light and moist, with the carrots adding nice color and sweetness and candied ginger bits adding zest and a bit of texture. Better yet, it makes two loaves, so you can eat one now and freeze some for later. Or, give it to your neighbors, who will probably appreciate it more than some more of your extra zucchini. Not that I have this problem – I made this bread with the only zucchini I managed to grow this summer. In two years, I’ve managed to produce two zucchinis. The Child loved this bread, as did her friends, much to my surprise, and the first loaf disappeared on a late-summer trip to the water park with her friends. The second loaf never made it in to the freezer; it was waiting for us when we got home, sunburned and hungry. Preheat the oven to 325°F. Coat two 8½ by 4½ by 2¾-inch loaf pans with oil or nonstick cooking spray. Sift together the sifted flour, ginger, cinnamon, baking soda, and baking powder into a medium bowl. Stir in the salt and candied ginger. In a large bowl, whisk the eggs until light and foamy. Add the canola oil, sugar, and vanilla, whisking vigorously until the sugar dissolves. Whisk in the carrots and zucchini. Add the dry ingredients to the egg mixture all at once and stir with a wooden spoon just until blended. Divide the batter evenly between the 2 prepared pans. Bake until the breads are well risen and firm to the touch, and a toothpick inserted in the center comes out clean, about 1 hour. Let cool in the pans on a rack for 10 minutes, then invert and finish cooling right side up on the rack. Everything comes to an end, and in the case of this past week, that’s really for the best. It started off well enough, and I had all sorts of ambitions for things I’d get done: My to-do list was long, my vegetable drawer full. By the end, the to-do list was no shorter and the vegetable drawer was still full, and even as Friday evening rolled around with time enough to do something about one of those things, I couldn’t find the list – it’s probably here somewhere, but I wouldn’t swear to it – and I had some awareness that me using a sharp knife at that moment was probably not the best plan. In any case, I didn’t want dinner as much as comfort. The Child didn’t want either. I flipped through The Dahlia Bakery Cookbook , which pretty much lives on my counter these days, and ran across these carrot muffins, which seemed like a good idea on several counts: I had all the ingredients on hand; spiced, baked anything sounded really good at that moment, and at least three of the carrots in my kitchen would get used before they expired. So, on the Friday night of the week that I hope is not a sign of how the new year is going to go, I made them. 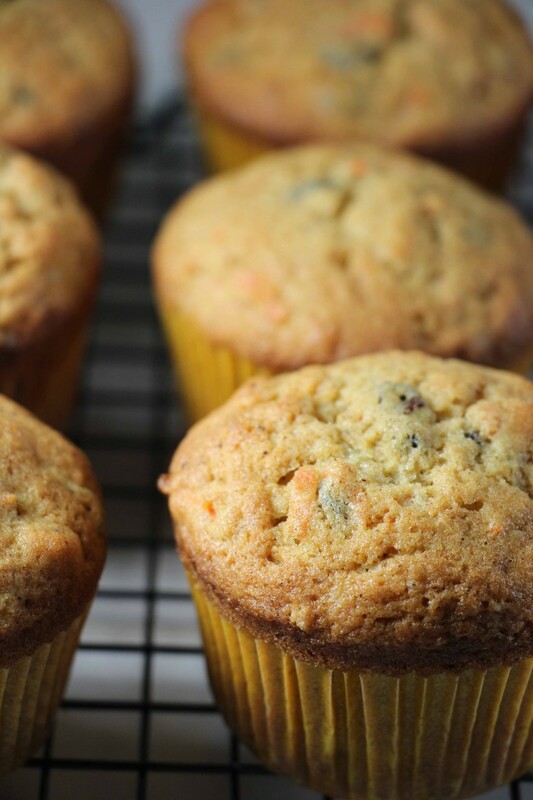 These muffins are delicious – buttery, light, moist, and spicy. Douglas uses a mixing technique I’ve not encountered before, layering the carrots and currants between the beaten wet ingredients and sifted dry ingredients, then folding the mixture just enough to blend. I’m not quite sure why, and if you happen know, please fill me in. The muffins didn’t rise quite as much as I expected them too, so I may have done something wrong (over-folded?). Still, I managed not to burn the butter, and render it a deep, nutty brown. There is something comforting about a house that smells like melted butter, and there are times when breakfast is what you really need for dinner. So The Child and I watched Disney movies together, and scratched The Dog behind the ears, and ate muffins out of the oven on a Friday night. Preheat the oven to 375°F. Line the muffin pan with paper liners and set aside. To make the brown butter, place the butter in a small saucepan over medium- high heat and cook until the butter solids are browned and smell toasty, stirring constantly, about 3 minutes or a little longer. Watch carefully so the butter does not burn. As the butter browns, the foam rises to the top and dark brown particles stick to the bottom of the pan. As soon as the butter is dark golden brown, pour it into a small bowl and set aside to cool to room temperature. Combine the currants with the water in a small saucepan and bring to a simmer over medium high heat. Simmer until the currants are plump, about 10 minutes. Remove the currants from the heat, drain, and transfer to a small bowl to cool to room temperature. Into a bowl, sift the flour, baking powder, cinnamon, and ginger together twice, then set the dry ingredients aside. In the bowl of an electric mixer, combine the eggs, sugar, orange zest, vanilla, and salt. Using the whisk attachment, whip on medium- high speed until thick and pale, about 3 minutes. Remove the bowl from the mixer. Without stirring, place the carrots and currants on top of the egg mixture. Then pour the dry ingredients on top and, using a rubber spatula, gently fold everything together. Finally, fold in the browned butter, combining everything thoroughly but gently. Scoop the muffins into the paper- lined muffin cups, dividing it evenly, using about 3 ounces, or about 1 ⁄3 cup, of batter per muffin. Bake until the muffins are cooked through and golden, about 18 minutes, rotating the pan once halfway through the baking time. A wooden skewer inserted into a muffin should come out with a few crumbs clinging but no batter. Remove the pan from the oven and cool on a wire rack about 10 minutes before unmolding. Douglas suggests grating the carrot use the largest holes of a box grater. I have no idea where my box grater is or if I still own one. I used the grating disc of my Cuisinart. Douglas also suggests sprinkling the top of each muffin with sanding sugar and salt before baking, which I didn't do, but would be a very nice touch.